Can a nutraceutical help reduce symptoms of body dysmorphic disorder? We are conducting a study to see whether a nutraceutical called N-acetylcysteine (NAC) can help in the treatment of BDD. NAC has been shown to improve symptoms in other mental health conditions, including conditions that are related to BDD, and we think it might be helpful in BDD too. Participation in this study involves taking NAC daily for a period of 16 weeks while we track your symptoms and monitor your wellbeing. There are four face-to-face visits required and compensation will be provided for your time and travel expenses. The specially prepared NAC will be provided free of charge for the study. If you believe you have BDD and are interested in participating, please contact Ryan Kaplan on 0431 136 523 or email rkaplan@swin.edu.au. 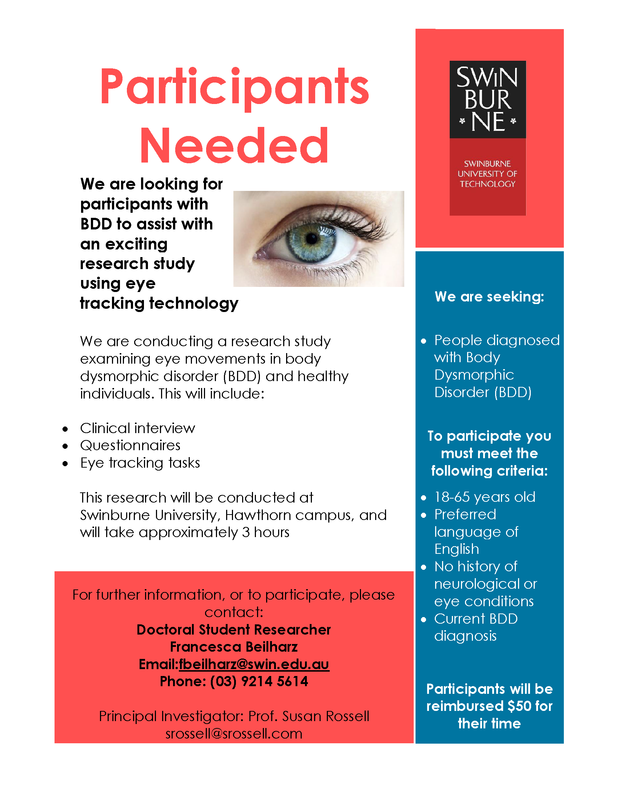 This project will examine visual processing in those diagnosed with body dysmorphic disorder and healthy individuals, by comparing where and how long these individuals look at certain images using eye tracking technology. A clearer understanding of eye movements in body dysmorphic disorder will help understand this disorder and develop innovative treatments. Participation involves attending a single session at Swinburne University in Hawthorn (Melbourne), which will involve a clinical interview, online questionnaires and an eye tracking assessment. This does not involve wearing any uncomfortable devices, as the eye tracker is simply placed on a computer monitor. The session will take approximately 2.5-3 hours. Participants will be reimbursed for their time and travel expenses. 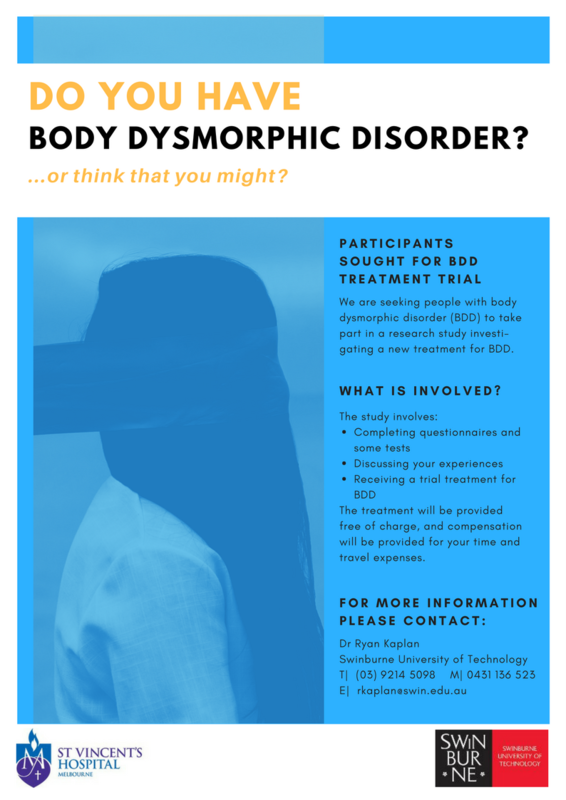 If you believe you have BDD and are interested in participating, please contact Francesca Beilharz on (03) 9214 5614 or email fbeilharz@swin.edu.au. Investigators: Ms Amy Malcolm, Ms Toni Pikoos, Prof Susan Rossell, A/Prof Ben Harrison, Prof David Castle, Dr Izelle Labuschagne, et al. This research project involves a comprehensive investigation of the features of Body Dysmorphic Disorder (BDD) and Obsessive Compulsive Disorder (OCD) in comparison to individuals with no psychological disorders. We hope to generate new and useful information about both of these disorders from this research. Participation involves attending two test sessions and having a magnetic resonance imaging (MRI) scan in Melbourne, and completing an online survey (this can be done at home). 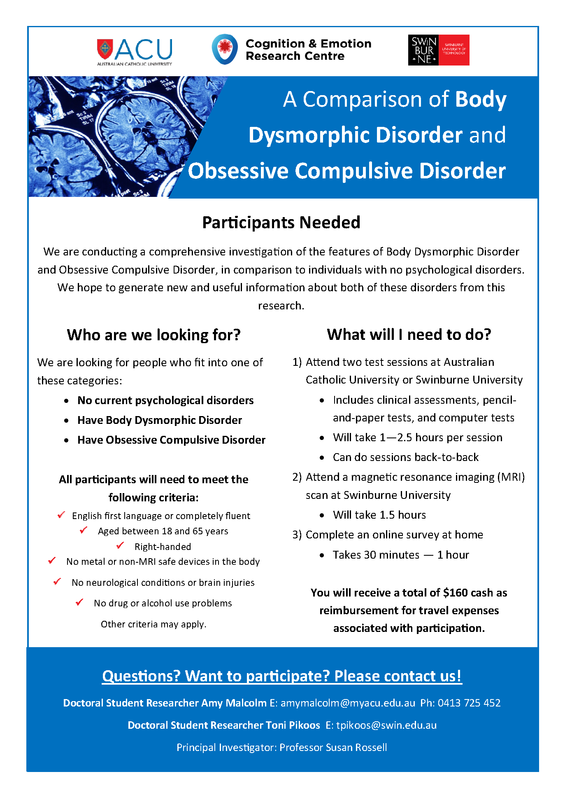 If you believe you have BDD or OCD and are interested in participating, please contact Amy Malcolm on 0413 725 452 or email amymalcolm@myacu.edu.au.